Can you sync a Pages library with Outlook? Can you sync the Pages list with an Outlook 2007 folder and still be able to read the HTML without the MOSS CSS and XSLT stuff? Well, my gut feel was no, but I thought I’d take a look. I found that the Connect to Outlook option was available on the Pages library settings, so I thought I’d give it a try. Yup, there you go – the XML of the page ListItem, and not a nice, rendered page with all the layout, master page, styles and stuff. Not really surprising, to be honest, but it would be nice if it did. I can’t think of how it might do that though – clearly the whole browser page would need to be rendered. An alternative would be to generate your pages via the Document Conversion Service, and to synch with the source documents themselves, rather than the pages. So what has Andy been working on lately? Well, lately I’ve been writing an integration between Outlook 2003 and SharePoint 2007. It was all a bit fraught – some of the web services I was using are a bit dodgy, uploading files and metadata as one transaction doesn’t seem to be possible, and everyone always underestimates the effort involved in coping with the metadata about an email. I’ve written an integration between GroupWise 6.5 and Open Text Livelink before now, and again, dealing with the metadata was a bigger effort than browsing the system or uploading the document. Now, email saving into SharePoint seems to be an overlooked thing. 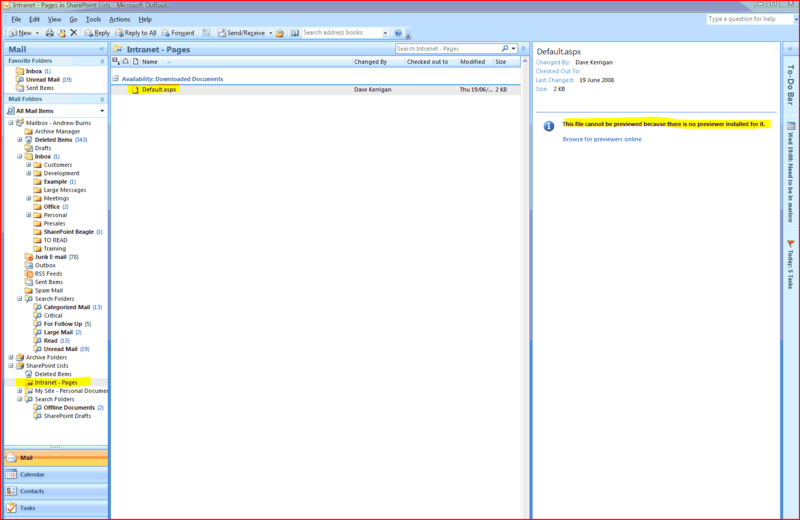 Microsoft have their Exchange 2007 Managed Folders, which can push emails into a SharePoint Records center. Liam Cleary has written his usual high-quality description of setting it up, and the MS Records management team blogged about it in parts I, II, III and IV. However, a lot of our customers aren’t impressed with this solution. They want to be able to save emails into particular SharePoint Libraries within their usual collaboration environment, rather than just booting them off into a Record Center. U2U built an Outlook 2007 addin which is very nice – though a bit of a different take. Their approach requires defining the save location up front and mapping to the data, but that then saving emails is dead easy – just drag them into the folder. Nice.